Today Prince Harry officially opened the Field of Remembrance @westminsterabbeylondon – a memorial garden organised annually by The Poppy Factory. Prince Harry laid a Cross of Remembrance in front of wooden crosses from the Graves of Unknown British Soldiers from the First and Second World Wars after which 'The Last Post' sounded and there was a two minutes’ silence. For this year's Poppy Appeal, The Royal British Legion recreated John McCrae’s poem, In Flanders Fields, across seven locations. The Royal British Legion encouraging people to #RethinkRemembrance and consider the meaning of the poppy as both a symbol of Remembrance and hope. On Thursday 9 November, Prince Harry officially opened the Field of Remembrance at Westminster Abbey. His Royal Highness was met by The Dean of Westminster, the President of The Poppy Factory and the National President of The Royal British Legion. The Field of Remembrance was first held in 1928, organised by George Arthur Howson, an officer in the British Army in the First World War and founder and chairman of the The Poppy Factory. In the 89 years since, the Field of Remembrance has been attended by Members of The Royal Family. Over 70,000 crosses are planted each year by the British Royal Legion, each carrying a personal message to someone who lost his or her life in the Service of our country. Prince Harry laid a Cross of Remembrance in front of wooden crosses from the Graves of Unknown British Soldiers from the First and Second World Wars. Afterwards, The Last Sound sounded and Big Ben chimed to begin a two minutes’ silence. HRH then visited the 380 plots, meeting veterans from past and more recent conflicts. The Field of Remembrance will remain open until Sunday 19 November 2017. Armistice Day is commemorated every year on 11 November to mark the armistice signed between the Allies of World War I and Germany. The agreement took effect at eleven o'clock in the morning—the 'eleventh hour of the eleventh day of the eleventh month' of 1918. The date was declared a national holiday in many Allied nations, and coincides with Remembrance Day and Veterans Day, public holidays. This photograph shows Royalty, servicemen and civilians celebrating together outside Buckingham Palace after the announcement of the Armistice which heralded the end of the First World War. The Royal Family can be seen on the balcony of the palace. On Saturday, The Duke of Gloucester who is Honorary Air Marshal of Royal Air Force, attended The Armistice Day Service at The National Memorial Arboretum in Burton-on-Trent. The Princess Royal, accompanied by Sir Vice Admiral Sir Timothy Laurence, visited The Menin Gate Memorial to the Missing is a war memorial in Ypres, Belgium. Read to the next chapter for more. On the morning of Saturday 11 November, The Princess Royal and Vice Admiral Sir Timothy Laurence attended The Menin Gate ceremony in Belgium. The Menin Gate Memorial to the Missing is a war memorial in Ypres, Belgium, dedicated to the British and Commonwealth soldiers who were killed in the Ypres Salient, one of the biggest battles of World War I. 300,000 soldiers died in the Ypres Salient. 90,000 of these soldiers have no known graves. The Menin Gate Memorial was unveiled on 24 July 1927 to honour them. Afterwards, The Princess Royal then visited Tyne Cot and Bedford House, Commonwealth War Graves Commission Cemeteries. The final resting place of nearly 12,000 Commonwealth servicemen, more than 8,300 unidentified, most of whom died in 1917. The 'Tyne Cot' blockhouse, a robust concrete fortification, was captured by the 3rd Australian Division in October 1917 and now stands at the heart of the cemetery. On Saturday evening, The Queen and other Members of The Royal Family attended the annual Royal Festival of Remembrance at the Royal Albert Hall. Joining Her Majesty was The Duke of Edinburgh, The Prince of Wales, The Duchess of Cornwall, The Duchess of Cambridge, The Duke of York, The Earl and Countess of Wessex, The Princess Royal and Vice Admiral Sir Tim Laurence, The Duke and Duchess of Gloucester, The Duke of Kent, and Princess Alexandra. The birth of Dame Vera Lynn. The 75th anniversary of the Battle of El Alamein and the creation of the RAF Regiment. Singers Emeli Sande, Tom Odell, Melanie C, Alfie Boe and Lesley Garrett are performed alongside The Queen’s Colour Squadron and The Band of HM Royal Marines. From the two World Wars to present day conflict, as the poppy petals fall, the Festival will remember all victims of war and those that made the ultimate sacrifice. The Festival was broadcast live on BBC One from The Royal Albert Hall and is available, for a limited time, on BBC iPlayer. The Queen and Members of the Royal Family attended the wreath-laying ceremony at The Cenotaph on Remembrance Sunday. The National Service of Remembrance, held at The Cenotaph in Whitehall on Remembrance Sunday, ensures that no-one is forgotten as the nation unites to honour all who have suffered or died in war. This year, at Her Majesty's request, a wreath was laid on her behalf by The Prince of Wales as The Queen joined The Duke of Edinburgh to view the Ceremony from the balcony of the Foreign & Commonwealth Office building. An Equerry laid The Duke of Edinburgh's wreath. Members of the Cabinet, Opposition Party leaders, former Prime Ministers, the Mayor of London and other ministers also paid tribute. Representatives of the Armed Forces, Fishing Fleets and Merchant Air and Navy were also present, as well as faith communities and High Commissioners of Commonwealth countries. After the service, ex-service personnel, civilians deployed on operations in support of the military, bereaved spouses, representatives of military and associations, and military charities all marched past the Cenotaph to honour fallen comrades, with The Earl of Wessex taking this year's salute. The next of kin of all members of the British and Empire Forces who died in the First World War were sent a message from The King, a scroll and a plaque. 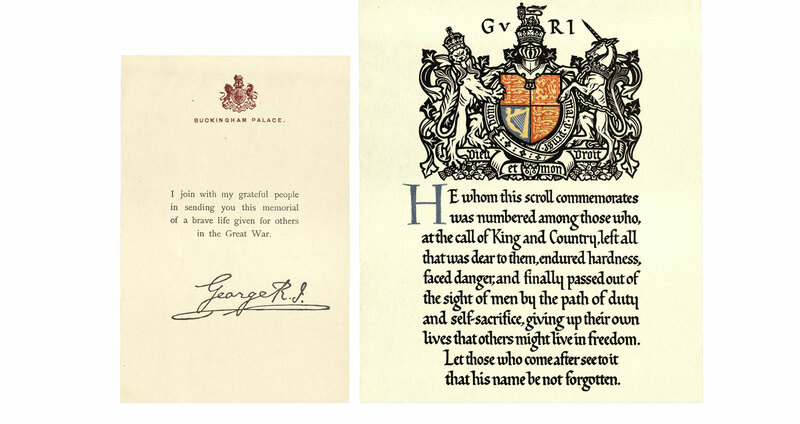 The message was printed on Buckingham Palace writing paper, and bore a facsimile of King George V's signature. The plaque design shows Britannia holding a trident and a myrtle wreath, with a lion standing at her feet and dolphins playing on either side. Around the edge is the inscription "He died for freedom and honour", and below Britannia's left hand is a space for the name of the dead man. From 1919 onwards some 1,150,000 scrolls and plaques were issued. They were sent to commemorate those who died between 4 August 1914 and 10 January 1920 for Home Establishments, Western Europe, and the Dominions. Messages for those from the Dominions, India, and the Colonies were sent by the respective Governors General, Viceroys, and Governors.